Someone else with his own theory behind the Sphinx’s date is author Robert Bauval. Bauval published a paper in 1989 showing that the three Great Pyramids at Giza, and their relative position to the Nile, formed a kind of 3-D ‘hologram’ on the ground, of the three stars of Orion’s belt and their relative position to the Milky Way. Along with Fingerprints of the Gods author Graham Hancock, Bauval developed an elaborate theory that the Sphinx, its neighbouring pyramids and various ancient writings, constitute some sort of astronomical map connected with the constellation Orion. Their conclusion is that the best fit for this hypothetical map is the position of the stars in 10,500 BC, so pushing the origin of the Sphinx even further back in time. This date is understandably disputed by Egyptologists, as not a single archaeological artefact dated to that period has ever been discovered in the area. There are various legends of secret passages associated with the Great Sphinx. Investigations by Florida State University, Waseda University in Japan, and Boston University, have located various anomalies in the area around the monument, although these could be natural features. In 1995, workers renovating a nearby parking lot uncovered a series of tunnels and pathways, two of which plunge further underground close to the Sphinx. Robert Bauval believes these are contemporaneous with the Sphinx itself. Between 1991 and 1993, while examining evidence for erosion at the monument using a seismograph, Anthony West’s team found evidence of anomalies in the form of hollow, regularly shaped spaces or chambers, a few metres below the ground, between the paws and at either side of the Sphinx. No further examination has been allowed. Today, the great statue is crumbling because of wind, humidity and the smog from Cairo. A huge and costly restoration and preservation project has been underway since 1950, but in the early days of this project cement was used for repairs which was incompatible with the limestone, and so caused additional damage to the structure. Over a period of 6 years over 2,000 limestone blocks were added to the structure and chemicals were injected into it, but the treatment failed. By 1988 the sphinx’s left shoulder was in such a state of deterioration that blocks were falling off. At present restoration is still an ongoing project under the control of the Supreme Council of Antiquities, who are making repairs to the damaged shoulder and attempting to drain away some of the subsoil. 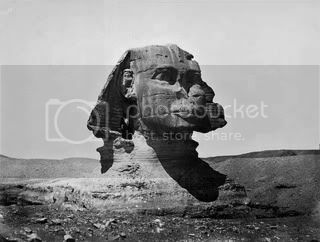 Consequently, today the focus is on preservation rather than further explorations or excavations, so we will have to wait a long time yet before the Great Sphinx gives up her secrets. Bauval, R. & Hancock, G. Keeper of Genesis: A Quest for the Hidden Legacy of Mankind. Arrow. 2001. Fagan, B. M. (ed). The Seventy Great Mysteries of the Ancient World. Thames & Hudson. 2001. James, P. & Thorpe, N. Ancient Mysteries. Ballantine Books. 1999. Jordan, P. & Ross, J. Riddles of the Sphinx. New York University Press. 1998.
http://guardians.net/egypt/sphinx – ‘Guardian’s Sphinx – Guardian of the Horizon’. http://www.touregypt.net/featurestories/sphinx1.htm – ‘The Great Sphinx of Giza – An Introduction’ by Allen Winston. http://news.discovery.com/archaeology/great-sphinxs-walls-rise-again.html – ‘Great Sphinx’s Walls Rise Again’.